Yosef Caro Synagogue – The Yosef Caro Synagogue was named for R’ Yosef Caro writer of “Kit Yosef” and “Shulhan Aruch. R’ Yosef Caro was one of the Jews who was expelled during the Spanish Inquisition, and he arrived in Tzfat in 1536. He was the chief Rabbi of Tzfat and the Av Beit Din until his death at age 87 in 1575. The Yosef Caro synagogue was first built in the 16th century as a Beit Midrash (House of Study), and was rebuilt after the 1759 earthquake, though in smaller dimensions. Hassidim who arrived in Tzfat after 1777 prayed there and assisted in rebuilding after the earthquake of 1837. Under the synagogue, according to tradition, is the house where “The Maggid” sat with R’ Yosef Caro and related to him the secrets of the Torah. From these visions came R’ Caro’s book “Magid Mishrim”. Ari Ashkanazi Synagogue The ARI Ashkanazi synagogue was built in the 16th century by Sepharadi immigrants from Greece (Grigos) on the northern border of the Sepharadi neighborhood. The students of R’ Moshe Cordovero were accustomed to praying in it. In 1570, when the ARI came to Tzfat, he joined the services of R' Cordovero's students and would take them to the field next to the synagogue to receive the Shabbat. Here he initiated the Kabbalat Shabbat service with hymns, psalms and prayers to usher in the Sabbath Queen. Until the 18th century, the synagogue continued to be known as the “Grigos” synagogue until it passed to the Hassidim who had begun to come to live in Tzfat. They renamed it the “Ari Ashkanazi” – "Ashkanazi" in memory of the Ari's Ashkanazi mother. The ARI Ashkanazi synagogue was destroyed in the earthquake of 1837 and was renovated 20 years later, as is noted in an inscription above the entrance. An ark of the Torah, on the southern wall of the synagogue, was carved by a Galatzian artist in the style of Eastern European synagogues. It depicts Moses together with the phrase “Thou shalt not make graven images”. Many legends are associated with the Ari Ashkanazi Synagogue. A small fence sits around a section where R’ Shmuel Heller saw the ARI, who had died in 1573, sitting in the 19th century. In 1948 a piece of shrapnel flew through a room full of people in services, yet hit no one – the pockmark where the shell hit can still be seen. Abuhav Synagogue – The synagogue, built in the 15th century, was named after R’ Yitzhak Abuhav, a sage from the 15th century Spain who wrote “Menorot HaMaor”. Legend tells us that R’ Abuhav wrote a Torah scroll, “Sefer Abuhav” which the synagogue houses in an ark on its southern wall until today. The synagogue caretakers remove this Torah scroll on Yom Kippur, Shavouth and Rosh Hashana. 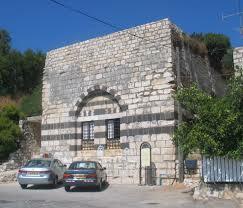 The original Abuhav synagogue was built near the cemetery, next to the Ari Sepharadi synagogue. During the earthquake of 1759, that original Abuhav synagogue was destroyed, and “Sefer Abuhav” was moved to “The Great Synagogue" which was renamed the new “Abuhav synagogue”. This synagogue was destroyed in the 1837 earthquake, and only the Southern wall, which housed the ark of the Torah scrolls, remained standing. In the middle of the synagogue floor is a blue canopy held aloft by four pillars. The pillars are covered with paintings and etchings. The stone benches which surround the bima (center stand) are in the style of the old Sepharadi synagogues of Eretz Yisrael. The outer walls of the synagogue were reconstructed in the early 20th century based on their original design. .
Avritch Synagogue -- The Avritch Synagogue was built by the Rabbi from Avritch, Rabbi Avraham Dov Auerbach. Rabbi Avraham Dov led his community of Hassidim through some of the most difficult periods of Safed's history, including a devastating 1834 pogrom and the 1837 earthquake. Minutes before the earthquake erupted Rabbi Avraham Dov called to his congregants who were with him in the synagogue "come and stand with me by the Torah scroll." The students rushed to the Torah and the entire synagogue collapsed, save for the area in which the men were standing. That portion of the synagogue remains today though the rest of the synagogue was rebuilt. The Avritch synagogue is open on Sabbath and holidays. Alsheich Synagogue -- The 15th century Alsheich synagogue, named for R’ Moshe Alsheich, was built as a Sepharadi synagogue with etchings and designs in the wide panels which circle the dome in the center of the synagogue. The outer wall's Hebrew inscriptions testify to the restoration of the synagogue which took place before the great earthquake of 1837. The synagogue wall contains an inscription that notes that, because of its renovation, the synagogue was spared destruction during the earthquake. The inscription mentions the builder who restored the synagogue, Ya’akov Falaji, the donor Yehezkel Reuven Menashe and the spiritual leader R’ Ya’akov Entebi who served Damascus as the chief Rabbi during the days of the blood libel there (1840). The Alsheich synagogue is also known as “The Istanbul congregation” which refers to the close ties that many members of the synagogue had to the Jewish community in Turkey. The Alsheich synagogue is open on Sabbath and holidays. There is no women's section in the Alsheich synagogue, as per Rabbi Alsheich's instructions. Ari Sepharadi Synagogue The oldest of all of Tzfat synagogues, the Ari Sepharadi was named for the ARI – R’ Yitzhak Luria, memorializing his Sephardic father. The synagogue was first mentioned in a 1522 writing as a holy place of worship for Jews from North Africa which was then called “The Eliyahu Ha’Navi Synagogue”. According to tradition, the ARI who lived in Tzfat from 1570 – 1572 used to pray there, and by the 1600s, it was already known as the ARI synagogue. Decorating the entrance to the synagogue are illustrations of the World of Nature. The huge western wall is known for its artwork. The synagogue is arranged in the fashion of old Sepharadi synagogues of the time, with benches surrounding the ark and bima. A small cave-room sits in the eastern wall, where tradition relates, the ARI used to learn Torah with Eliyahu HaNavi, Elijah the Prophet. In the 17th century a large stone was placed in the entranceway of the cave to protect its holy space but today it is possible to enter the cave. We are told that the synagogue was partially destroyed in the 1759 earthquake. Further destruction came in the earthquake of 1837, and it was rebuilt with the donations of Yitzhak Gueta. In 1929 riots, the synagogue was used as a shelter to protect the Jews against Arab rioters. In 1936 a watchtower was placed there to guard against Arab rioters and in 1948 the Hagana stationed soldiers there to guard the Old Quarter. In 1990, the synagogue was renovated, and the Ark was restored in the style of the time of the ARI. Yossi Banai Synagogue/ HaTzadik HaLavan – The oldest standing Sepharadi synagogue in Tzfat, it was built by refugees from Argonia, Spain, in the late 1400s. It was built on the upper border of the Mustaravim neighborhood before the Sepharadi neighborhood was expanded in the early 1500s. (The Mustaravim were Jews whose families had been in the Land of Israel for many generations preceding the return of those who came after the Spanish expulsion of 1492). 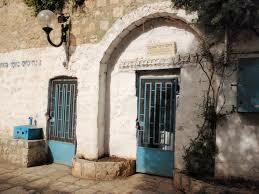 Next to the synagogue is a small room where R’ Yossi Banai, one of the 3rd century Amorim (sages), is buried. R’ Banai was known for mapping out the burial places of the great sages who are buried throughout the North of Israel. The synagogue was only partially destroyed by the 1837 earthquake. The restoration is mainly in the form of the low wood ceiling in the prayer area, but the women’s section and the burial room are the original construction. There is an old Torah in the synagogue which was donated in the 19th century by the Sepharadi community in honor of R’ Abuhav. This Torah scroll accompanies the yearly processional to Meron on Lag B’Omer. 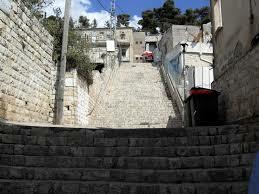 The Jews of Tzfat tell the legend of the “miracle of the chickens” that occurred in the merit of the Tzaddik HaLavan. An edict was issued which would have expelled the Jews from Tzfat unless a certain number of white chickens were delivered to the Turkish ruler. Jews prayed to the Tzaddik HaLavan for intervention, and all the chickens of Tzfat turned white. Old Cemetary of Tzfat Burial caves and thousands of tombstones crowd the Old Cemetery of Tzfat, demonstrating proof of Tzfat’s history and place in Jewish heritage. Thousands of years of burial speak to continued settlement of the area. The cemetery covers 120 dunum and over 4000 tombstones with inscriptions can be seen. Burial caves from the Roman and Byzantine (1st – 5th century A.D.) periods are embedded in soft limestone, archeological evidence of Jewish life in the area during the Mishnaic and Talmudic periods. 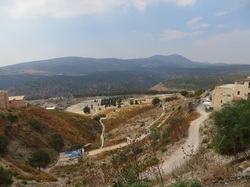 Towards the western side of the mountain, a gravesite with a domed roof shows two gravesites – the first from the 8th century BCE of the prophet Yehoshua Ben Hannia, and the second, as noted by the ARI, the grave of one of the compilers of the Talmud, R’ Pinchas Ben Yair (2nd century A.D.). The cemetery in Tzfat is known primarily as the resting place for the great rabbis of the 16th century, among them, R’ Isaac Luria (the ARI), his son Moshe, Rabbi Moshe Cordovero (the RAMAK), R’ Shlomo Alkebetz (compiler of the Lecha Dodi), Rabbi Moshe Ben Yosef Mitrani (the MABIT), Rabbi Yosef Caro (writer of the Shulhan Aruch) and others. ​From the end of the 18th century, separate sections were established for Sepharadi and Ashkanazi burials. After the massive 1837 earthquake, gravesites were dug created for the over 2000 souls who were killed, but it was impossible to lay tombstones for them. The cemetery has areas where victims of WWI’s famine and epidemics are buried, as well as victims of the 1929 Arab pogrom in Tzfat, Jewish underground fighters who were hung by the British (Oleh HaGardom) and soldiers killed during the War of Independence. Burial in the Old Cemetery ceased in 1962, and a new section was established. Over 200,000 pilgrims make their way annually to the Old Cemetery of Tzfat yearly to pray, many of them on the 5th of Av, the yartzeit of the ARI. Lit candles can be seen nightly on the gravesites of the great scholars who are buried in Tzfat – the tombstones painted in the famous Tzfat blue color. Mikve HaAri – A small spring fills this mikve in which many great rabbis have immersed, among them R’ Yitzhak Luria, the “Ari”. Throughout the generations, Tzfat Kabbalists and other rabbis have adopted the custom of the Ari of immersing twice on Erev Shabbat (Shabbat eve). The Ari’s students would relate that the Ari would not towel himself after immersion “because these are waters of Shabbat, and it is fitting that the body absorbs these waters”. One of the Ari’s students, R’ Chaim Vital, related that the Ari arose and immersed himself in the mikve after his own death. From that day onward it has been traditional in Tzfat to immerse the bodies of the deceased in the mikve before burial. Many immerse themselves daily and immersions on Erev Shabbat and during holidays are especially desirable. Some people even splash their clothing with water from the mikve, in the tradition of the Ari. ​Kikar HaMeginim – The center of the Old Ashkanazi Quarter of Tzfat was called, in Yiddish, “kolin Platz – Coal Square”. This area was the headquarters of the “Haganah” during the War of Independence. The name “Kikar HaMeginim” comes from “Megini Tzfat”– defenders of Tzfat during the War of Independence. Saraya– The Saraya was built in the mid 1700s by D’har Al-Omer, the Bedouin Sheik of the Galil as his family’s living compound. When his rule ended in 1775 the building was taken over by the central Turkish administration. A hundred years later a British survey referred to the building the “Turkish Khan”. In the late 1800s, the building was renovated and became “the Saraya”, the center of the local Turkish government. The clock tower was built in 1900 in honor of the Sultan Ibid Al Hamid II. When the British arrived in Tzfat following WWI the Saraya became the seat of British government, and served as a shelter for Jews fleeing Arab riots in 1929. During the War of Independence, the Saraya became the center of the Arab High Command. After the war the Israeli army used it and subsequently it became a community center in the name of Isaac and Edith Wolfson. Beit Ashtam – Beit Ashtam stands out among the stone buildings of Tzfat. It was built on the border of the Jewish quarter following the Arab riots of 1929 by “Keren Ezra” on top of the ruins of homes which were destroyed by the Arab rioters. Ashtam was the first building built in Tzfat by Solel Boneh, meant to serve as a cement barricade across from the Arab quarter. Later, a factory for jerrycans and primus burners was established. In 1948 Beit Ashtam was used as a weapons warehouse for the defenders of Tzfat and it was one of the most important strongholds of the Hagana's’ defense of the Old Jewish Quarter. The walls of the building show the pockmarks of the bullets fired in the Arab attempt to take the building. On the side of the building is a memorial plaque to Yehoshua Faraj Ohana, a young man from Tzfat who was killed on his watch. Beit Abu –The tradition of making a pilgrimage to the gravesite of R' Shimon Bar Yochai on Lag B'Omer dates to the ARI who initiated the yearly pilgrimage in the 16th century. In the 19th century people began to initiate the procession at the home of the Abu family, accompanying the family's Torah scroll to Mt. Meron in a festive processional. The procession leaves the Abu house each year with the Torah scroll leading among singing and dancing. In the 1950s this procession was noted by the Kenesset as the official opening of the Lag B’Omer festivities. The Magrab Synagogue – Only the western wall remains at the site of the “Magrab” (Lvov, or Lemberg) synagogue The synagogue was built by R’ Mordichai Zev from Lvov, evidently around 1840, and fell among the ruins of Tzfat after WWI. On the remaining wall, one can see the imprint of lions etched in the stone, as well as hands outstretched in the manner of the traditional Cohen blessing. On the left-hand side is written “Hekdesh Olam” along with the name of Ephriam Fishel (Auerbach), one of the leaders of the Hassidim who came to Tzfat in the early 1800s who came from Uman in the Ukraine. ​Stairs of Ma’a lot Oleh HaGardom – Stairway built by the British after the riots of 1936 to separate the Jewish and Arab quarters of Tzfat. The stairs were guarded by British snipers who observed from the Post Office at the top of the stairs on Jerusalem Street. A guard tower on the top of the building lit up the stairs at night by projector lights. During the fighting in 1948, this area was called “Stalingrad” by the Haganah because it was judged to be the most dangerous in the city. The name “Oleh HaGardom” comes from the memory of members of the Jewish pre-State underground who were hanged by the British and buried in the Tzfat cemetery. Metzuda The Metzuda is a central site of Tzfat history. It was first settled, evidently, by Yosef Ben Matitiyahu about 66 BCE. Recent archaeological excavations have uncovered evidence of this settlement. During the First Crusader conquest of Israel Tzfat came under Crusader control and in 1102 the Crusaders built their first fortress there. Salach-al-Din captured the fortress from 1179-1188, and his family controlled the area for 52 years until the Crusaders returned and recaptured it in 1240. The fortress was rebuilt and reinforced and it became the Crusaders’ largest Middle East fortress. The Beibars were able to trick the Crusader defenders into leaving it in 1266 and they subsequently massacred the Crusaders and destroyed the fortress. The Beibars erected a 60 meter monument at the site. During the Ottoman rule in Tzfat, from 1516 onward, the city expanded but the Metzuda remained unpopulated and builders in the city brought the stones from the fortress into the city for building. In the 18th century the Bedouins captured the Galilee and they partially renovated the Metzuda. Napoleon also ruled over the area for a short time in 1799. In 1837, the area was completely destroyed by a massive earthquake, and the Metzuda was abandoned. The British planted pine trees on the Metzuda and erected a monument to their soldiers who had died during WWI there. 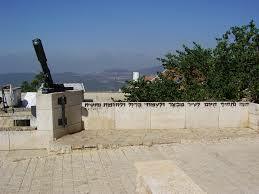 In 1948, as the British were evacuating Tzfat, they turned over this high point to the Arab forces. Jewish forces captured the citadel after a long and protracted battle, giving them control of the entire city. In 1951 the city build a park on the Metzuda along with a monument memorializing the Jewish soldiers who died in Tzfat during the War of Independence. 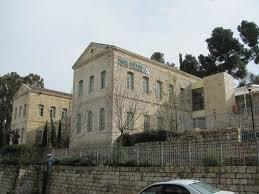 Rothschild Hospital/Tzfat Regional College – The Rothschild hospital opened in 1912 as an alternative to the missionary hospital which operated across the street. Gan HaIr, the City Park, was once used as a recuperation area for hospital patients. In 1919 the Hadassah women’s organization began to run the hospital. Many influenza sufferers came as patients to the hospital, among them Rachel the Poet (1925). In the courtyard visitors can see the memorial stone of the hospital’s head nurse from that period, Tova Bat Moshe Pestrovsky. In 1948, the Rothschild hospital served as the Israeli Army’s Hospital #7 for the Northern Command. In 1973, the hospital moved to its new location in the south of the city and the building became a teacher’s seminar. Today, the building serves as part of the Michlala Tzfat College campus under the auspices of the Bar Ilan university. Beit Bussel -- Beit Bussel first opened in 1904 as a hospital operated by a group of British missionaries for Jews of the Galillee and Tzfat. The hospital continued to serve local Tzfat Jews until the Rothschild hospital opened in 1912. During WWI the hospital ceased functioning as a hospital and was put into use by the Turkish army. In 1921 the building transferred to a Scottish missionary group which used it as their college until the riots of 1936. When the college closed the building became a post for the British Military Governor For Jewish Affairs in the Galillee. In 1942, the building was sold to the Jewish National Fund which set it up as a recuperation hospital. They named the hospital for Yosef Busel, one of the founders of Kibbutz Degania Aleph. During the War of Independence the Haganah used Beit Busel as one of their Jewish Quarter outposts. The Scottish Church – This was the center of Scottish missionary activity in Tzfat from the end of the 19th century until the 1948. The building, built in the British-colonial manner, was never completed. In the 1920s Ya’akov Meyer Richman, an American Jew who came to live in Tzfat after WWI, bought the building and the building then became known as “Beit Richman”. In 1948 it was used as a frontline defense against the “Fatma” stronghold of the Arabs on the Metzuda (citadel). After the War of Independence, it became a rehabilitation hospital and in the 1970s became a school Today it serves as a Talmud Torah. Red Mosque – The Red Mosque is one of the oldest Mameluke buildings in the Land of Israel still standing today. It was built in 1276 by the Beibars according to inscriptions written above the wooden door at the entrance to the mosque. The Mameluke Beibar king ruled the region from 1260-1278, capturing Tzfat in 1266 and calling it the “capitol of the Beibar’s Northern Empire – the Tzephed Empire. The Red Mosque was built in the Egyptian architectural style of the Mamelukes. The builders built a half-arch in the grand entrance, covered with typical Mameluke engravings and a Rosta at its center. The prayer hall is in the southern section of the osque, with pillars that point to the direction of Mecca. The mosque was also used as a hostel for travelers by the Moslem Wafk (religious authority). The mosque was partially destroyed by the earthquakes which decimated Tzfat throughout the years and visitors can still see cracks in the Muzzazin. 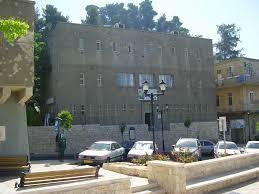 Today, the building is used as a center for art and culture under the auspices of “Keren Tzfat L’Pituach”. The Mameluke Mausoleum -- The mausoleum is a 14th century Mameluke burial plot. 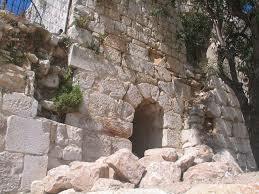 It was built for the governor of Tzfat, Mutfur A-din Mussa Eben Haj Arokati, who died in Tzfat in 1372 It continued to serve as a mausoleum for burials until the early 20th century, In the southern wall near the main entrance vistors can see 3 Mameluke inscriptions. Today the building is used by Freemasons. Shuk Mosque – General Exhibition -- This building houses the permanent exhibition hall for Tzfat artists. Above the entrance to the building is an Arabic inscription which notes that this building was erected in 1901. The mosque, whose foundations predate 1901, was the center for Arab incitement against the Jewish residents of Tzfat during Friday prayers and it was from this mosque that the rioters set out to murder the Jews during the Arab uprisings of 1929 - 1948. In the beginning of the 21st century extensive restorations were undertaken on the building and an addition was added. The General Exhibition is the center of the Artist Quarter, which was founded in the early 1950s by artists who felt that the atmosphere of Tzfat gave expression to their art. Among the artists in the Artist Quarter were some of Israel’s greatest artists who shaped the Israeli art world. These included Yitzhak Frankel (Frenel), Simcha Holtzman, Aryeh Merzer, Moshe Kastel and Menachem Shemi. During the height of the Artist Quarter more than 50 artists and sculptors worked and displayed their art in Tzfat. Artists' connection to Tzfat can still be seen in the town's galleries and local artisans and artists. City Police Station – The building housed the British police station during the British Mandate. It was one of the Tigrat fortresses which were built county by Sir Charles Tigrat to help the British secure the country. It was built in the latter 1930s as the main security point to guard the no-mans-land which separated the Jewish and Arab quarters (today the Ma’alot HaGardom stairs). During the period of the British Mandate it was the headquarters of the local police where Arab and a few Jewish policemen served. It’s yard was surrounded by a concrete wall (destroyed after the War of Independence) guarded by a “pillbox” guardhouse. The bullet holes seen in the pillbox testify to the difficult battle that took place at this spot after the British handed over this high point to the Arab forces when they evacuated Tzfat in April 1948. Succeeding fierce battles for this point took the life of the Haganah commander Yitzhak Hochman, and the memorial plaque memorializing him can be seen on the pillbox lookout. Two additional plaques are also visable for Amishalom Milkovski and Raphael Edri, sons of Tzfat who fell in the Yuval campaign to conquer the Negev. After independence the income tax authorities and then, the local academic college of Tzfat, used the building.